I need a little bit of help getting my Furuno GP-32 connected properly to OpenCPN using the Keyspan USA-19HS serial to USB Adapter. Prior, I was running Nobeltec Admiral 9 with this GPS and adapter and it worked with no issues. I went out and bought a brand new Dell PC with windows 10 and installed OpenCPN on it with the Keyspan software. 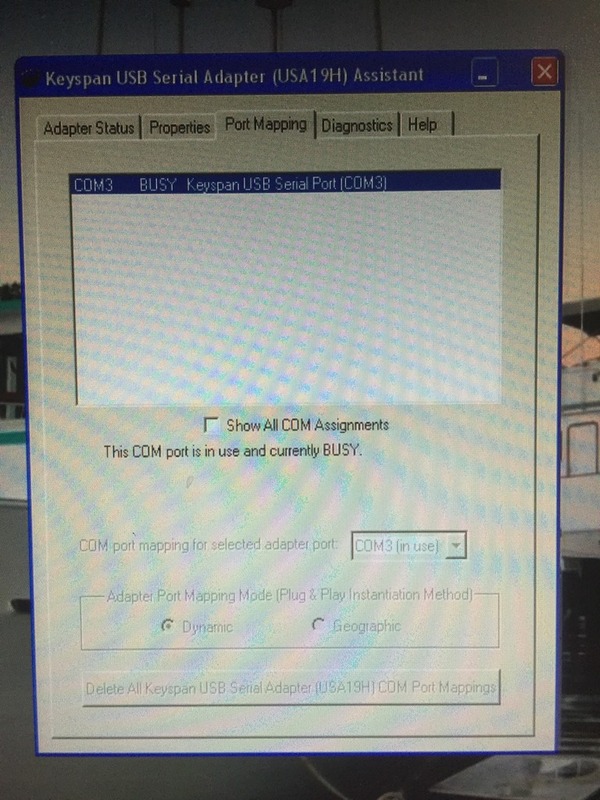 I then plugged everything in and started up the keyspan software which sees the adapter and is outputting to Com 3. I then fired up OpenCPN and added a connection. OpenCPN sees the GPS now but it's showing that the signal is only 2 out of 3 bars in the GPS Status Window in the upper right corner. Also when I enable to the Dashboard plugin and then add GPS Status, it should show all the individual satellite connections, I see none. What am I missing here? Do I have something configured wrong or is this the way it's suppose to function when using the Keyspan adapter? The GPS antenna is on the boat roof and has a full clear shot of the sky. In Nobeltec, I had full signal strength from from this GPS and adapter setup. Thank in advance for your help guys. If OpenCPN sees anything from the GPS, then the Keyspan adapter is working fine. It is a good USB-Serial converter. So, we need to look at the sentences that your GPS is sending. 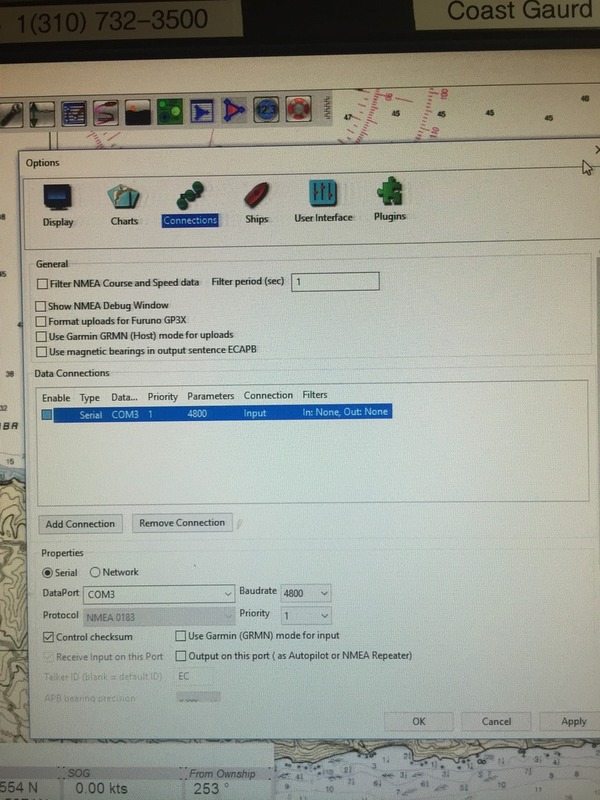 Open the options->Connections dialog, and tick the "Show NMEA Debug Window" box. You will see a window with NMEA strings being received from your GPS. Screenshot this window, and post here for analysis. Thanks Dave, will do. The boat is at sea right now so I will get this as soon as possible. You may try to alter the baudrate in the OpenCPN settings to a value higher than 4800 as you have actually set right now. Even when the input for keyspan is 4800, its output might be set higher. So no bits are discarded. Keyspan is a high speed (HS) unit. I got back down to the boat today and took a couple videos of the debug windows, one is with the auto pilot output turned on and another with it turned off. I then tried changing the output on my Furuno GP-32 from NMEA-REM1 to NMEA-REM2 and it made no difference. I then tried turning WAAS off and on, no difference as well. I then went into the Keyspan program and changed the Endpoint setting from "Compatible (Interupt)" to "High Performance (Bulk). This made no difference either. I also played around with the Transmit Completion Timing Advance and Receive FIFO Buffer Size. No difference with those either. Just for heck of it, I decided to try something. I shut down the Furuno GP-32 and then plugged in a little USB puck type GPS made by Garmin called the GPS-18 USB. I then loaded the drivers for it, and then installed Franson GPS Gate to covert the Garmin signal to NMEA. 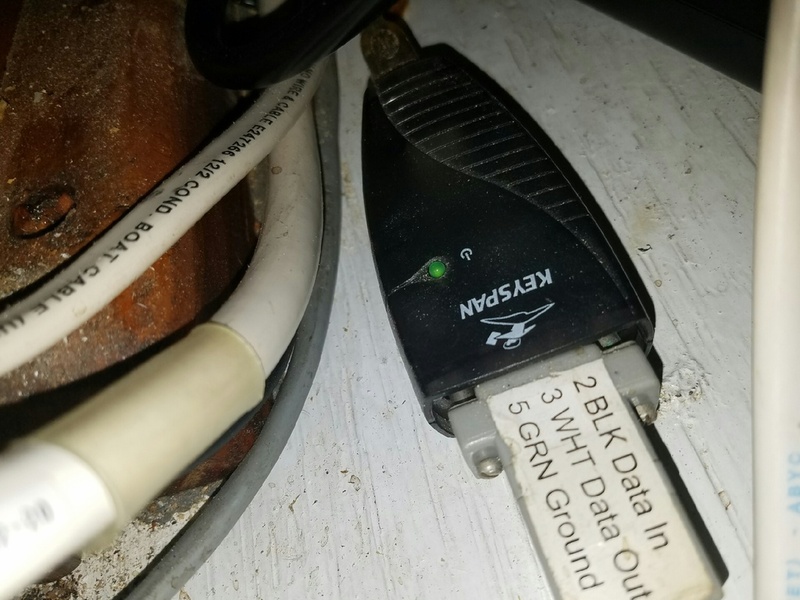 I set GPS Gate to Output to COM 5 and then created the connection in OpenCPN. It picked up the GPS immediately with full signal (3 bars) in the status window in the upper right and the dashboard plugin showed the satellites. This GPS was inside the wheelhouse too, not even a clear shot to open sky. The antenna for the Furuno is on the roof outside. Whats going on with OpenCPN and the Furuno? It worked fine in Nobletec. This is all normal. There is no problem with your setup. The position is accurate. According to the GGA message in the data stream, the Furuno is using 8 out of a possible 12 satellites. OpenCPN is giving this a score of 2 bars. Entirely normal. In order to see the satellites on the Dashboard, OpenCPN needs to get GSV messages. And there are no GSV messages in the data stream. Maybe there is some configuration available for the Furuno that will enable those GSV sentences. Thanks for this info Dave, I appreciate it. I will check on the Furuno to see if I can turn on GSV sentences. It just seems strange that a Furuno with an antenna on the roof is receiving less signal than a little Garmin USB GPS sitting on the dash inside the wheelhouse. I count 7 satellites with signal on the Furuno and 8 with signal on the Garmin. Do you recommend that I turn WAAS off or on for the Furuno? I wonder if this will help or not. I am in Southern California and using the boat along the coast of the Pacific.